Amazon Top 100 Best Seller for sales & selling, skills & techniques. 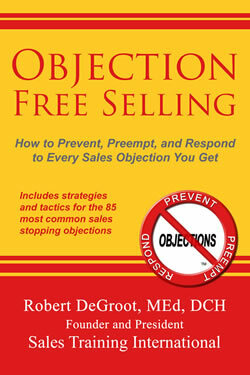 This unique book, written by Dr. Robert DeGroot, contains the knowledge, skills, and strategies you need to prevent, preempt, and respond to every sales objection you get, including how to answer the unanswerable objections. Click this link to buy the book. Objections that stop almost all sales are common and repetitive. Specific Buyer Beliefs, when missing or weak cause these objections. There are many ways to establish these beliefs to prevent the objection from even entering the prospect's mind. Before you buy something, this book for example, what’s just one thing must you believe about it? If you don’t believe that, what objection comes to mind? But, if you did believe that, what happens to the objection? You just demonstrated that a missing Buyer Belief caused the objection and that when the belief is in place, the objection goes away. There are 10 of these critical Buyer Beliefs in which all sales objections can be categorized. Salespeople get most of their objections in just three to five categories of missing Buyer Beliefs. Learning how to prevent, preempt, and respond to a few objections in each category will handle all objections in that category. It doesn’t matter which sales model salespeople are using if sales stopping objections are getting through. The strategies and formulas provided work with all sales models. Probability has it that right now you know salespeople who are facing sales stopping or stalling objections, the answers to which are in this book. Could these potentially stalled or lost sales be enough to cost-justify the $9.95 for the eBook or the $19.95 for the paperback? Buy the paperback and get the ebook for $2.99 on Amazon.com. Help salespeople get a copy of this book. Identify the objections they get. Look them up in the book (reference guide). Select and personalize the strategies to prevent, preempt, and respond to every one of them. Write these strategies on index (flash) cards to speed learning. If they forgot or don’t know a skill needed to implement a recommendation, the expectation is that they look it up in the book and learn it as well. Measure the results which are immediate, observable, and sustainable. 3. We are satisfied with whom we have now. 5. We do it internally with our own people. 6. I can't use anymore ________. 7. My boss won't authorize anything. 8. It will never get through the system. 9. I have to consult with ________. 10. That's not my area. 11. That has value but not for me. 12. Home office requires we use ______. 13. We have to use your competitor. 14. He/she isn't here anymore. 15. Just send me your literature. 16. Don't have time to discuss this now. 17. No one is paying attention to this area. 19. It's too much hassle. 20. We won't use it. 21. No money budgeted, call me next year. 23. Not a priority now. 24. Timing is not right, see me next month/year. 25. I need to think this over. 26. Too many things in front of this. 27. It just won't work for us. 28. Never had good results with _________. 29. This isn't for us. 30. Don't want to stick our necks out on this. 31. You don't have what we need. 32. Your lead times are too long. 33. Management is taking a different track. 34. I need better quality than what you offer. 35. We want someone in our industry. 36. How do you know it will do that? 37. Never heard of you. 38. You're not large enough to handle the job. 39. I don't like your company. 40. I don't like your products/services. 41a. You don't understand our problems (needs). 41c. You don't understand our problems (capability). 42. Your track record isn't strong enough. 43. Had a bad experience with your company. 44. That can't be done. 45. I don't believe it. 46. I've never heard of your company. 47. You'll have to prove that to me. 48. Never had good results with _________. 49. Your ________ is not good enough. 51. You don't have what we need. 52. Don't see any reason to change. 53. We've got to look at a number of suppliers. 54. Been doing business with them for years. 55. Not sure yours will work as well. 56. My brother-in-law is in the business. 57. Don't see any difference. 58. What makes you different? 59. Why should I buy from you? 60. We do it internally with our own people. 61. We want a band aid not a full work over. 62. Costs too much to change to your products. 63. We just like your competitor's product. 64. Not in the budget. 65. Your competitor does it for less. 66. Your price is way out of line. 67. Costs too much to change to your products. 68. I can’t justify spending that much money. 69. My boss will never approve it (money). 70. Your price is too high. 71. We need a better price. 73. You’ll have to do better than that. 75. No one will use it. 76. Can't see how we could implement it. 78. Change is tough to do around here. 80. They will never buy into it. 81. I'm not comfortable with this idea yet. 82. This is a lot to think about. 83. They will resist doing it. 84. We need time to adjust to this. Objections are an error in the sales process. This book provides several examples of how to prevent, preempt, and respond to each of these objections. These errors are most often caused by missing a step or not doing one or more steps completely. Select this link to view the Strategic Sales Plan. Select this link more information about the Strategic Sales Plan: Why Sales Fail and How Wins are Won. How is this book different? What's in this book? What would that book have been worth to you? Get this book now and start customizing and personalizing the strategies and tactics for each and every objection you get. Build your own sales strategy book. How great will you feel when you can handle any objection that comes your way? Get started today, buy the book now, and never again get an objection you can’t handle! Book sold separately on Amazon.com, Barnes and Nobel, Books-A-Million and retailers around the world.